Single parents, Indigenous populations and new Canadians bear the brunt of inequality. A homeless person is seen in downtown Toronto, Jan. 3, 2018. A new survey from the World Economic Forum shows Canada's economy, though strong on the surface, is leaving many people out in the cold. For a country that prides itself on ranking highly on best-countries lists, this is embarrassing. And a bit of a wake-up call. A new survey from the World Economic Forum shows Canada's economy is leaving many people out in the cold. The country underperformed on the World Economic Forum's Inclusive Development Index (IDI), ranking 17th out of 29 developed nations. 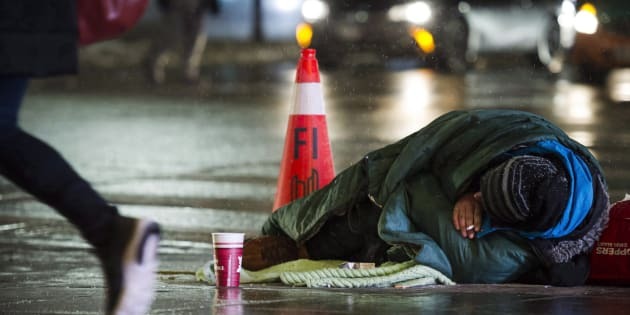 "Canada's poverty rate is dropping but still disproportionately affects vulnerable groups such as single-parent households, Indigenous populations, and newly arrived immigrants and refugees," the WEF said in a report released last week. The IDI is meant to provide a broader sense of how well an economy is performing than the conventional gross domestic product (GDP) measure, which only measures economic output. In addition to GDP, the IDI measures elements such as life expectancy, employment, income gains, the poverty rate and income inequality. While Canada scored highly on median income, employment and life expectancy, it scored very low marks on income inequality and the poverty rate. It also ranked poorly on a number of measures having to do with the sustainability of its economy: Canada has a low savings rate, high debt levels and has relatively high carbon emission intensity compared to other advanced economies. But Canada is by no means the only country struggling with these issues. Over the past five years, the 29 advanced economies surveyed for the IDI saw three-per-cent GDP growth, but "have on average flatlined in terms of inclusion," the WEF said. "Over the past five years, despite a growing world economy, social inclusion has fallen or been unchanged in 20 of 29 advanced economies and intergenerational equity has deteriorated in 56 of 74 emerging economies." Richard Samans, managing director and head of global agenda at the World Economic Forum, said policymakers "need a new dashboard" when looking at the economy — one that will allow them to measure whether economic growth is actually improving living standards. "Economic growth as measured by GDP is best understood as a top-line measure of national economic performance. Broad, sustainable progress in living standards is the bottom-line result societies expect," he said in a statement.